My plan for my Easter Holidays was take on one of Krystal’s De-cluttering Challenges and use her expertise to “get a handle” on my paper clutter! My paper piles have been haunting me for over a year! Something had to be done. It’s tax time again and every time I tried to get to my sewing machine, I would trip over the stacks of paper. I planned for this project to take several days. It was that bad. I set up a “system” following Krystal’s advice. 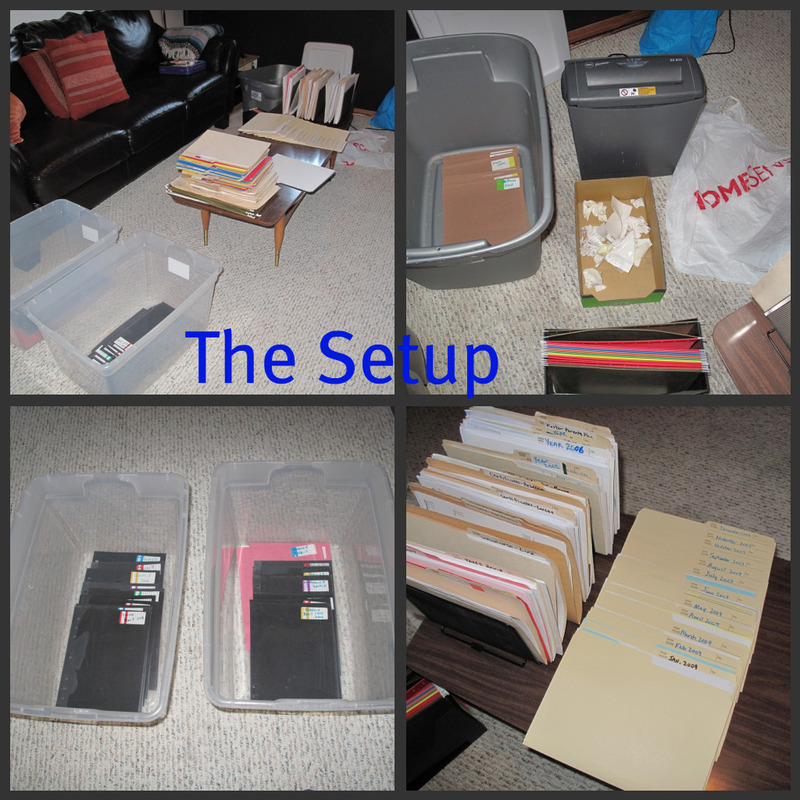 One of the most important things she said: Setup everything you need to organize the stuff within easy reach. I then tackled part of a pile at a time. I didn’t drag ALL of it out! I setup around the big comfy couch. I was going to put a movie on and watch movies while I tackled the piles. The big bins are for the kids’ memory boxes. I just used the black dividers that I had for separating the kids’ stuff by age/grade. I labelled for all years from 0 to Grade 12 so that I just have to keep adding to the boxes as they bring “keeper” stuff home. I’m keeping things like report cards, birthday cards, special pictures and stories that they’ve made that I want to keep. Their pictures are in there as well. Krystal’s filing system involves setting up a file for each month to contain bills, receipts, pay stubs etc; the regular stuff that comes every month. I pre-labelled everything for the year. There are also files for important things to keep. For example, two files per member of the family. One file for important papers: birth certificate, Social Insurance number etc. The second for certificates and things that I keep having to pull out, such as swimming lessons. There are also files for important papers like investments, warranties, etc that need to be kept separate from the monthly stuff. I had a master sheet with a list of all the file folders as I was creating them so that I wouldn’t create duplicates. I used a filing rack to keep the special folders easily accessible. The monthly folders were just laid out on the table. I got garbage bags and the shredder ready and within easy reach so that I could shred as I went so that I wouldn’t have yet another pile of shredding to do at the end. The first day, it only took me 7 hours to process those piles! It wasn’t as bad as I thought! 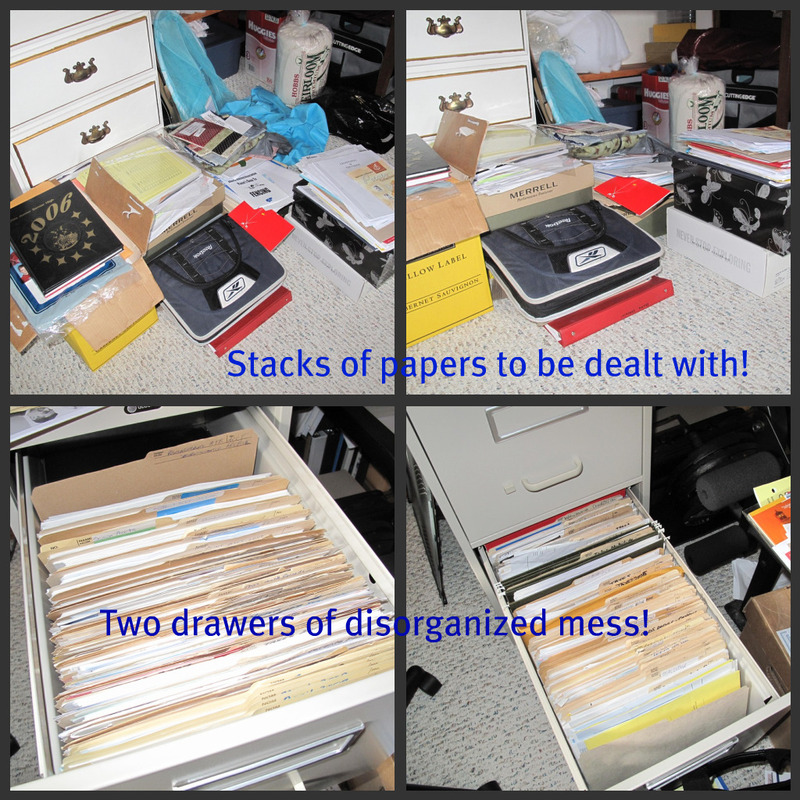 Then, the next day, it took me about 3 hours to go through the stuff in the drawers, get rid of a drawer’s worth and then put the new files into the ONE drawer!!! I thought this job would take me a week, but with the system, I was able to do it in about 10 hours total. 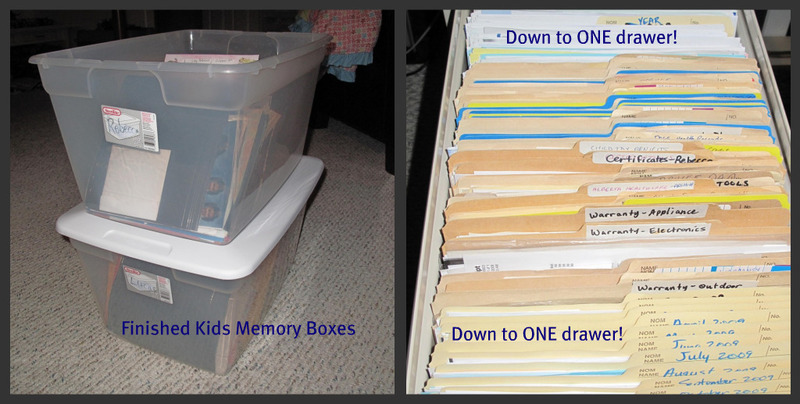 The Kids’ special stuff was organized into their boxes and all of that paper work was narrowed down to just one drawer! What’s the best part? This system will be so easy to keep up with! As the bills are paid, I just put them in the 1 folder for that month. As the kids bring home “keeper” stuff, I simply put it in the corresponding year of school in that kid’s bin. Easy! As other important folders need to be created or added to, they are all right there in that one drawer! I have scheduled one hour a week to do that week’s paperwork. It is in my calendar. I know I can handle that! Contact krystal@simplelifecelebrations.com for an interview. She can help you get control of the clutter too!